No matter whether you’re chatting with your friends or listening to the steps of your enemies in a game. Your ears should deserve the best headset for gaming available. The best headset is not just the gaming peripherals, it should mean more than that. Therefore, in this review, I’m going to share my best information about the Creative Sound Blaster to show you why its one of the headsets around. The Sound Blaster is very comparable to the V-MODA Crossfade M-100. The best gaming headset is not one-size-fits-all and here, I’m not just talking about comfort, but also how budget-friendly the headset is. 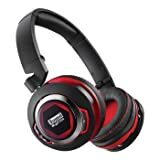 One of the best cost-effective and excellent headsets for gaming entertainment in the world is the Creative Sound Blaster EVO USB Entertainment Headset, which satisfies as a worthy headset for movies and music as well as games. The features of this entertainment headset are described below in a detailed manner. The sound blaster headset features 40mm FullSpectrum drivers which produce high-quality audio and gives crystal clear communication with its dual microphone array. Ear cups in this headset cover your ears fully, so it cancels noise fully from the outside. Thus, when you’re outside, you hear only your music or songs that matter to you. This headset has friendly high-quality voice pickup which features voice control applications. So, you can hear voice accurately, even you’re in a noisy environment. Dual mic array in this headset removes background noise and ensures voice clarity. This headset allows you to fold up to 70% of its original size. Thus, it is very easy to carry in its carrying pouch. This advanced sound blaster headset features personalization on audio via PC or Mac. A control panel of this device gives the advanced audio processing through PC or Mac. And, you can save this options and make use of it when you’re on the go. By using either USB cable or analog 3.5mm jack, you can connect this headset to your PC or Mac. It comes with an analog cable for connection or by the analog cable separately and makes use of it. What’s in this entertainment headset package? The sound blaster EVO USB headset comes with the following items. Q: What is the length of included analog cable? A: The length of attached analog cable is 1.2m that is 3.9ft. If you feel this is short, then buy your own cable and use it. Q: Can I use this headset on my smart device? A: Yes, you can connect this high-quality audio headset to your smart device, PC, and Mac. Do you want to buy a headset for multi-purpose including gaming? Want to use it on your smart devices? Then, I strongly recommend you to get the Creative Sound Blaster EVO USB Entertainment Headset, which meets all your needs. This device got 3.9 stars out of 5 for its ultimate features. The Creative Sound Blaster EVO is an awesome pair of headphones. Produces high quality audio. Highly recommended.